I'd only taken my little Teklon spinning rod and Mitchell reel loaded with 20lb Nanofil the gear I normally use in the rivers. My lure was the silver, Mepps-type, home-made lure with a green, Betalight body that served me well for catching in the dark last year. I took off my bag and put it down before advancing to the edge of the rocky ledge and flicking out the spinner. I'll swear it hadn't touched the water (it surely must have done?) and I was in! 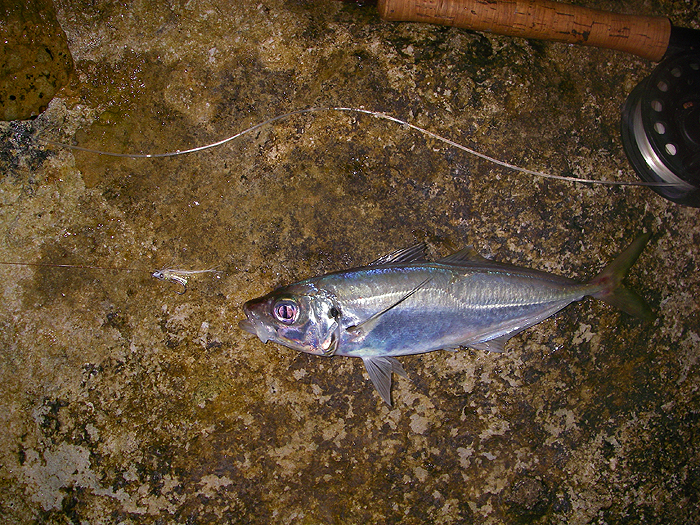 The fish wasn't very big so I reeled it in and swung it to hand to find that it was a small scad. Good start. Back it went and out went the lure once more - another fish on! This time it was a mackerel. I grabbed the camera and took a picture then, when I tried to take a second one the "battery dead" sign came on - what a downer. Fish after fish took my lure, often before I'd managed to flick the bale closed. I began to keep a tally in my head and it was easy because I rarely had a fishless cast. If a fish came unstuck something else would take before the lure had travelled a couple of metres - almost unbelievable. I switched to a Toby but the bites slowed down so it was back to the Lumi-lure. 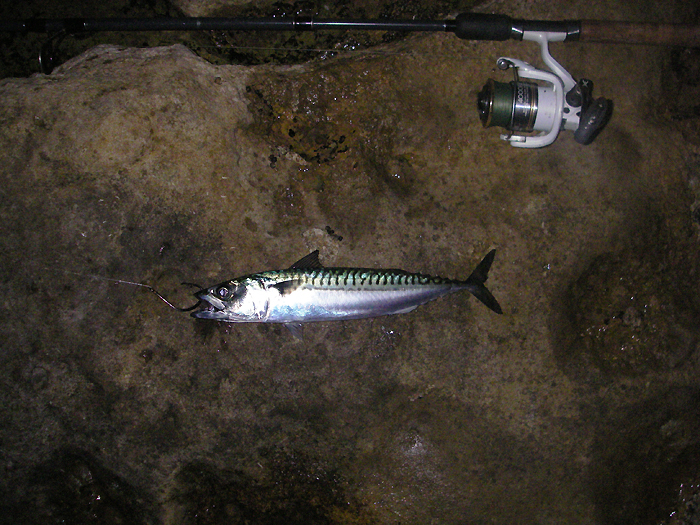 I tried a couple of casts with big Redgill but only managed to foulhook a huge mackerel. So I reverted to the killer lure. As the sky began to lighten the bites slowed a bit. Occasionally I reeled in without a fish on the end. When I reached the point where I had three successive blank casts I packed in. I looked at my watch to find that I'd been fishing for just over one and a quarter hours. My catch had totalled 47 mackerel and 11 scad, this was despite a few minutes lost in changing lures. Most of the fish I shook off so that they fell back into the sea, keeping just a few mackerel for my Autumn bait fishing activities. After my hectic morning I decided to go again the following day but to start a little earlier - 04:00hr. This time, as well as the spinning gear, I took my fly rod and a livebaiting rod. The previous evening I'd tied myself a little fly with a tiny green, betalight fixed to the hookshank in a bit of clear shrink tube given to me by my pal Dave Little. I started with the fly and at once I hooked a scad, then another and another. To be fair they don't fight like mackerel so when my fifth or sixth cast connected with a fish that hooped the fly rod over and even took some line I knew it was a mackerel. This one fell off as I tried to lift it so I picked up the spinning rod and flicked the lure out. The tugging fight told me that I had another scad which again dropped off before I could lift it. The next three fish all fell off as I tried to land them (don't ask me why) so I tried another cast with the fly and almost at once caught a mackerel. This one was lightly hooked so I lip-hooked it on the livebait gear and set it swimming out to sea. 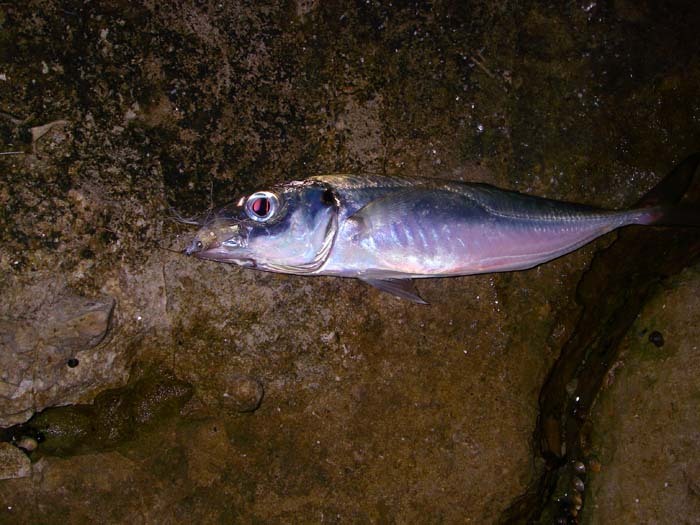 Now I have to say that, even though I know that freelined mackerel livebaits produce good bass, standing holding the rod while a mackerel powers about on the end of the line can be a little tedious. I much prefer to do it when I have a pal with me who is doing something else to keep me interested. Anyway, after forty minutes or so without a sniff on my bait I reverted to spinning. By now it was ten past five and pretty bright. Amazingly there was nothing doing, even though on the previous morning the fish were still biting well at this point. I guess that the sky was clearer and the light stronger than when I had the mackerel bonanza. Still, at least my little Lumi-fly had worked and I'd given the livebait a decent run out. I'll be back. The Chesil. 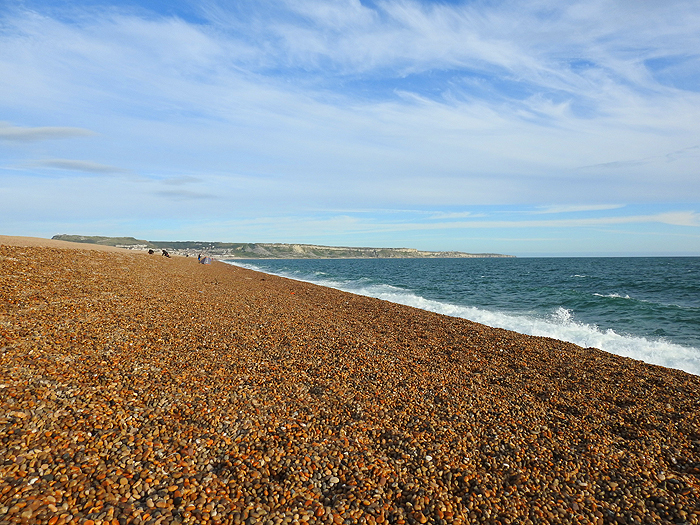 Miles of shingle beloved of sea anglers. 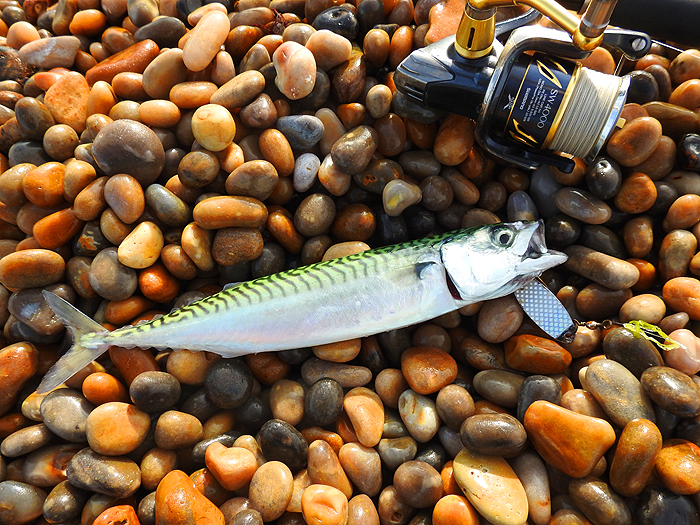 One of Bill's Chesil mackerel. This one clearly took a wedge. 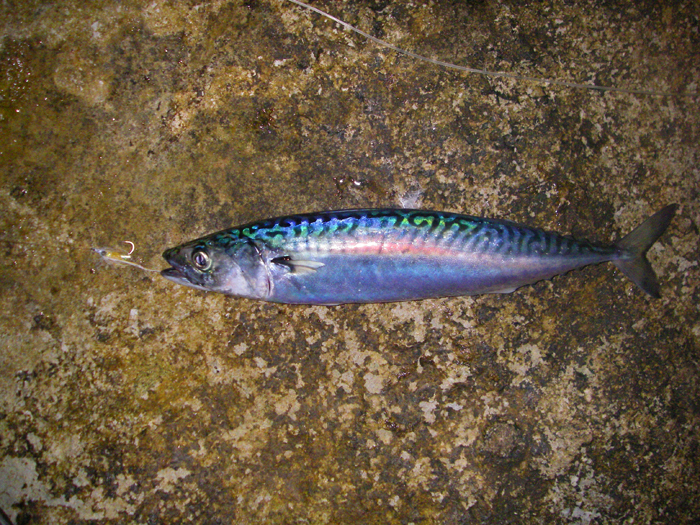 A decent mackerel on my Lumi-lure. This tiny scad was the first fish on my Lumi-fly. 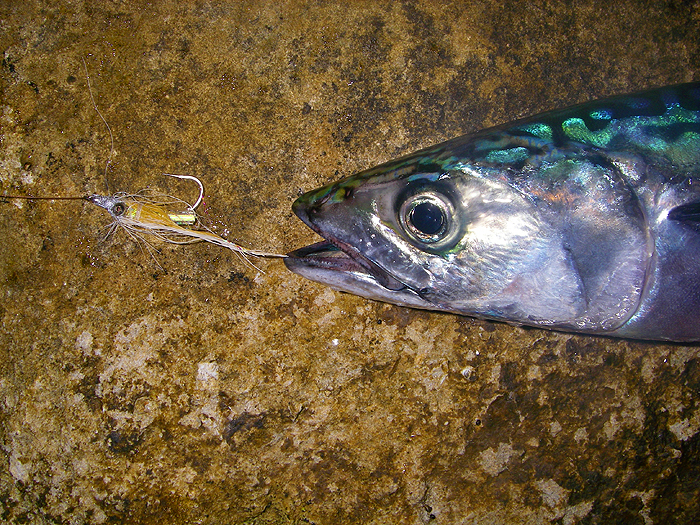 Another fly-caught scad - they may not fight so hard but they are beautiful fish..
A hard running mackerel on the fly. A close up of the fly - stainless hook, spot of fluff, couple of metal eyes and a Betalight in shrink tube. 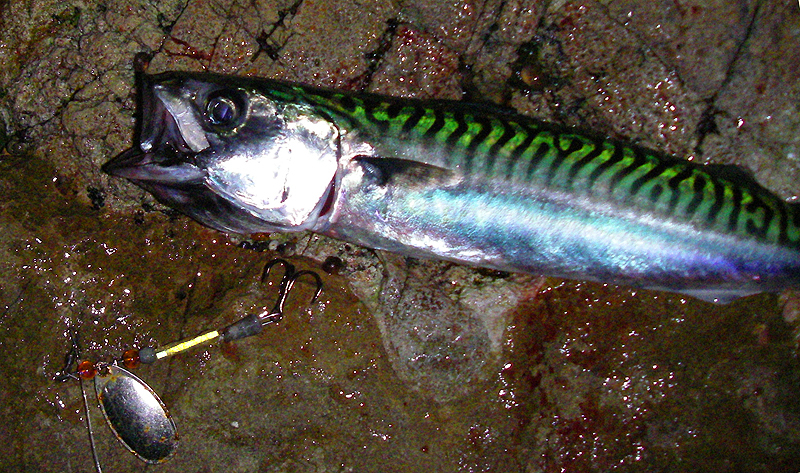 Mackerel rigged for livebaiting on an 8/0 circle hook.